So a few weeks ago I grabbed a snippet of the TV show Designing Women broadcast on LifeTime, and posted it on YouTube. It was a funny bit about the high cost of membership to an exclusive club, where one of the characters envisioned holding her daughter's debutante/coming out party. The punchline was "for those prices, she ought to do more than just 'come out'...she ought to burst through a hoop of fire on Nancy Reagan's shoulders." I found the imagery hilarious, so I posted it. 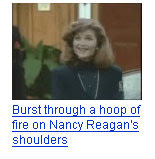 Sony Pictures Entertainment has claimed some or all audio and visual content in your video Burst through a hoop of fire on Nancy Reagan's shoulders. This claim was made as part of the YouTube Content Identification program. Your video is no longer available because Sony Pictures Entertainment has chosen to block it. Sony Pictures Entertainment claimed this content as a part of the YouTube Content Identification program. YouTube allows partners to review YouTube videos for content to which they own the rights. Partners may use our automated video / audio matching system to identify their content, or they may manually review videos. Please Note: Repeat incidents of copyright infringement will result in the suspension of your account and all videos uploaded to that account. In order to avoid future strikes against your account, please delete any videos to which you do not own the rights, and refrain from uploading additional videos that infringe on the copyrights of others. For more information about YouTube's copyright policy, please read the Copyright Tips guide. If you believe that this claim was made in error, or that you are otherwise authorized to use the content at issue, you may file a counter notice. For more information on this process, please see: How do I file a counter notice? Please also take a few minutes to visit our Help Center section on Policy and Copyright Guidelines, where you can learn more about copyright laws and our Video Identification Service. wonderful website! I really like this, I have learned a lot of things.